We are renowned as supreme manufacturers and suppliers of Two Post Car Lifts which have features such as longer functioning life, high performance and low maintenance. We develop them with the help of high grade materials and these are known for excellent usage, no overhead mechanisms and low power consumptions. Locking Unit for Cable Turning Angle. 5 mm Column Steel Plates (International Standards). 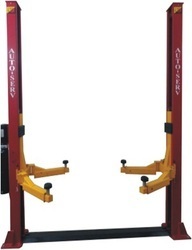 Looking for Two Post Car Lift ?